Wasn't it interesting how Lords Patten and Heseltine - early advocates of the disenfranchisement of party members - became silent on the issue? They knew that Ken Clarke, their choice for leader, cannot win amongst MPs but just might amongst party members. 44% of swing voters think he is the best person to lead the Conservative Party [Populus/The Times, Sept. 2-4 2005]. Ken has the greatest support of any candidate in all regions, amongst all kinds of voters and in Scotland and Wales (ICM/Newsnight, Sept. 2-4 2005). At least 40% of all voters think Ken Clarke is the best person to lead the Party [ICM/Newsnight, Sept. 2-4 2005; Populus/TheTimes Sept. 2-4 2005 ]. As former Labour Party chair Clive Soley has admitted [Daily Telegraph 28.08.09], Ken is the leadership candidate Labour truly fears. As leader, Ken Clarke leader would reduce the gap with Labour to just 2% [Populus/The Times, Sept. 2-4 2005]. 12% of all voters are more likely to vote Conservative under Ken Clarke’s leadership [ICM/Newsnight, Sept. 2-4 2005]. Ken Clarke as leader would extend the Conservative lead over the LibDems to 15% [Populus/The Times, Sept. 2-4 2005]. 10 Conservative held Parliamentary seats would be lost if there was a three per cent swing to the Liberal Democrats. In order to form a Conservative Government, the Party must not only halt the rise of the Lib Dems but take seats back from them. Ken has more than twice the level of support of his nearest rival in the Conservative leadership contest amongst 18-24 year-olds and over four times the support of women (ICM/Newsnight, Sept. 2-4 2005). The Conservative Party has particularly lost support amongst younger voters and women voters. The Conservative share of the female vote actually fell in May’s general election. In order to win back power the Party has to win support in these groups. The party has doubled its representation in local government over the last few years but success in the shire counties has not been matched in the cities. The first set of elections the new leader will face will be those in May next year, including the important London borough elections. Ken has the appeal to reach voters who live in these urban and suburban areas. He tops the poll in every age category, social class and geographic region [ICM/Newsnight, Sept. 2-4 2005; Populus/TheTimes Sept. 2-4 2005]. More voters think the Conservative Party has changed for the worse since 1997 than think it has changed for the better (Populus/The Times July 22-24 2005). Ken Clarke is the original “moderniser”. He has always believed the Conservative Party should be a party open to all who share its values. He will lead the development of an open and professional party through his Shadow Cabinet team. Ken Clarke is the candidate best placed to beat a Government lead by Gordon Brown at the next general election [Populus/The Times Sept. 02-04 2005]. Omigod. What have I done? This morning David Davis' tally has hit the impressive total of fifty. Just as impressively he has got there with a public declaration of support from the whole of the frontbench home affairs team. Those who have worked most closely with him in the last two years haven't run into the hands of another courtier but have stayed loyal to Mr Davis. With just over 25% of the parliamentary party backing him, Mr Davis must be secretly wishing that he won't have to face the party grassroots. At the beginning of this phoney election process a Davis victory was thought most likely amongst rank-and-file members. He is now more vulnerable if the Constitutional Convention rejects the Howard-Maude-Monbiot disenfranchisement. (1) "Public services are provided for the many and not the few". "They are universal services that everyone can use and they will continue to be free at the point of use and largely funded by taxation". He rejected the idea that Tories should subsidise opting out into private sector services. (2) "Just because they are public services does not mean they have to be provided by the public sector". "The voluntary sector, the private sector and religious bodies all have a distinctive and invaluable contribution to make". (3) "It is no good putting more money into public services without reform". (4) "Let reform work in a genuinely localised way". "The centre needs to be small but effective," he said: "The vast range of units, advisers, and quangos created by Labour will have to be removed. We should reduce the size of central Government Departments dramatically... The number of targets and central directions must be cut to a handful of sensible priorities". (5) "Public services are not all the same". "We must not put various taxpayer-funded services in a box labelled “public services” and assume that common solutions apply to their problems. What is right for education may not be right for health; the reverse is also true." It was a very cautious speech - particularly when compared to David Davis' public reform speech of July. Mr Clarke downplayed the importance of choice and said that the Conservatives enjoyed "no licence from the voters to shake up public services because many people still suspect that we just want to privatise them in order to save money and then cut taxes for our rich friends". The Telegraph interpreted the speech as an effective renunciation of the 'right to choose' agenda pursued by Michael Howard and still championed by Mr Davis. "Abandon reform of [public] services" was the headline the newspaper chose for its report of Mr Clarke's speech. Ken Clarke appeared on BBC1's Sunday AM this morning. It gave KC his first opportunity to comment on his campaign's failure to bag David Willetts. "What on earth induced him to go across to David Davis this time, I'm not quite sure," was the former Chancellor's blunt reaction. DW will still have a big job if he becomes Tory leader, however, KC promised. "Gordon Brown yesterday ripped up the most successful monetary policy Britain has seen for many years... My approach was well-known. I always listened carefully to the advice of the Bank of England. But, at the end of the day, I took my own decisions on interest rates. More often than not I was proved right. Mr Brown himself has recognised that the Bank's recent record has been mixed. Setting out his plans for monetary policy in February, he said that "the Bank must demonstrate a successful track record in its advice and build greater public credibility" before being handed operational responsibility for interest rates. He argued that "we must observe the Bank's track record of advice in the future" before taking such a step. So it is all the more strange that he should take such a radical step when the Bank's record under the new government is no more than four days long. Within days of the general election, Mr Brown has gone back on his own considered view. As the new chancellor's first major policy decision, it is a remarkable performance." If markets are to have confidence in a chancellor, the first condition is that the chancellor must have confidence in himself. By giving away control of one of the key levers of economic policy only days after taking office, Mr Brown has made it clear he is not ready to take on the full range of responsibilities that his predecessors have exercised. Yesterday's unnecessary and over-hasty decision puts Britain's economic prospects at serious risk. It abandons a tried and tested approach that has delivered the best inflation performance for decades. It hands complete operational responsibility to the Bank of England at a time when its recent record is at best mixed. It is a hasty decision that Mr Brown may come to regret. The 1997 Mr Clarke had a clear preference for the "tried and tested" Ken & Eddie show where Ken listened to Eddie's advice but made the decision on interest rates. That, most certainly, is not Bank of England independence. It's clear that the last Tory Chancellor did not always support independence for Eddie George's Old Lady. Does this inconsistency matter? My guess is that the electorate doesn't mind changes of mind but it's best to be honest about them. This small episode won't help Mr Clarke's carefully cultivated reputation for straight-talking, therefore, but it's hardly a big deal to a candidacy that appears to fly beyond conventional forms of scrutiny. Most observers appear uninterested in KC's policy positions or inconsistencies. His biggest backers - people like Tim Yeo, John Bercow and Ann Widdecombe - have very different views of the world but constantly explain their support for KC by citing his "popularity". Whilst I was astonished at KC's three attacks on Republican America in the one interview others were wowed by the feel of the overall performance. Andrew Marr's newpaper reviewers - Jane Moore and Tim Rice - spoke effusively about Mr Clarke at the end of the programme. 'Kandidacy Ken' sometimes appears more of a personality cult than a considered political project. "It's time to stop going back again and again over the arguments about whether we should have gone to war in Iraq. We did. It was three years ago. We can't change the past. If we keep on arguing about the rights and wrongs of what happened, all it will do is undermine the efforts of our troops on the ground in Iraq. We know that some commanders have said that their men have asked them if they still have the backing of the people back home. I think we should send them a clear message that they do - and that we are proud of the fact that they are helping to build a democracy in Iraq in the face of extremist forces who are determined to destroy it." It will be interesting to see if David Davis also soon feels the need to confront Ken Clarke. Yesterday’s YouGov poll pointed to a closer-than-expected leadership contest, at least if the party grassroots retain their vote. Mr Clarke’s Old European views may be the obvious target for Mr Davis. Mr Davis will be very cautious, however. Two of Mr Clarke’s former ideological soulmates – Damian Green and Ian Taylor – have recently endorsed Mr Davis. The Shadow Home Secretary won’t want to risk losing their support by making strident attacks on Mr Clarke’s views. He will be well-advised to use surrogates. He will not be unhappy at Dr Fox, Michael Ancram and Norman Tebbit doing his work for him. Today has been christened Super Thursday in the Tory leadership campaign. Liam Fox launched his campaign and the frontrunners - Ken Clarke and David Davis - both gave big speeches on the economy. Mr Clarke's speech was very solid and overlapped (in many respects) with David Davis' 'Gordon Brown's Seven Deadly Economic Skills' analysis. 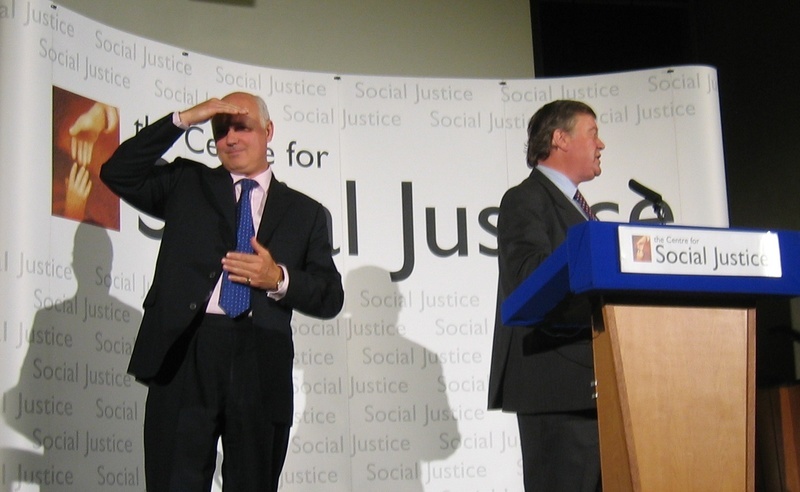 Both spotlighted Gordon Brown's high spending and stealthy taxation but the two speeches also lifted the veils on two very different economic views. Mr Clarke is basically a fixed pie man. David Davis is a bigger pie man. Mr Clarke believes that spending restraint must precede any tax cuts. Mr Davis believes that tax cuts are essential to incentivise the kind of growing economy which supports increased public spending. Ken Clarke: "What I do say is that reducing the tax burden can only follow reducing the growth in public expenditure. Tax cuts that are made before public spending control is achieved can only be financed by borrowing and borrowing is merely tax deferred. Conservatives are not in favour of tax cuts because they benefit the better off. We know that low tax economies are the successful economies. All of us benefit from the economic growth that low taxation can stimulate. But we must be honest with people and tell them tax cuts can only come only when they are affordable. And probably the first area for tax relief when we have done the necessary work to make it affordable will need to be pensions and savings rather than cuts in direct personal taxation." David Davis: "Britain is one of only three countries in the EU where the tax burden will increase both this year and next. In fact, that burden will soon be at its highest level for 25 years. Other countries have taken a different path and have outperformed the UK as a result. In Australia, for example, the government has increased spending more slowly, run budget surpluses and steadily reduced taxes, lowering the basic rate to 15 per cent and raising the top rate threshold. Since 1996, Australia's economy has expanded by a third, compared to only a quarter in Britain. And just across the water, Ireland's tax-cutting policies have helped them overtake Britain in terms of the amount of GDP generated per head. As a flat tax revolution sweeps around the world, fuelling growth and raising living standards, Mr Brown's only response is to bury the evidence of its benefits and to sweep the idea aside. Contrast this approach with yesterday's intelligent speech on this subject by his Conservative opposite number." Ken Clarke is basically accepting the frame which Labour has chosen for the tax debate. That frame says that one person's tax cut is another person's spending cut. It's a frame that tilts the tax and spending debate to Labour's advantage and the Clarkeites would rightly argue that it is the way most voters see the tax debate. A Clarke-led Conservative Party would say to the British people that you can have lower spending and lower taxes but the spending restraint must happen first. Mr Clarke's remarks do point to the economic benefits of low taxation but that message is secondary. David Davis - and George Osborne yesterday - are both wanting to escape from Labour's frame. They want to argue that taxes need to be used as an economic tool. Tax cuts, they say, are essential to a healthy economy and we must cut (or dramatically simplify) taxation if we are to keep Britain a hi-growth, hi-employment economy. Mr Davis emphasises spending restraint but the incentive effects of lower taxation are uppermost in his analysis. The 'Clarke versus Davis contest' - if that is what this leadership contest becomes - will be a very real contest. 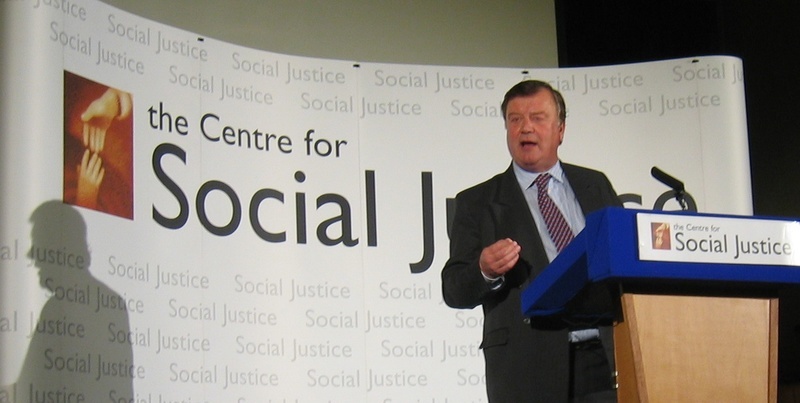 Ken Clarke is a multilateralist (believing in the EU and UN) and is opposed to the Iraq war. David Davis is a Eurosceptic and supporter of the Iraq stage of the war on terror (a position he confirmed - albeit a little half-heartedly - on today's World at One programme). The different emphases that characterise their economic worldviews represent another critical point of difference. "If the party believes that in the end it has to choose a leader because of his views on the single currency then in my opinion it is beginning to lose touch with reality and will deserve to be in opposition for quite a long time." Ken Clarke may be keen to sweep the issue of Europe under the carpet but Deputy Tory Leader Michael Ancram is determined that the issue of "irreversibility" be addressed. In a speech yesterday (to Tory activists in Wiltshire) Mr Ancram said that it was "quite absurd to argue that the French and Dutch referendums have somehow made Europe a non-subject". The Eurofederalists, he said, are still determined to protect their bureaucratic and undemocratic structures. Mr Ancram called on the next Tory leader to address the EU's impact on our fishing and agricultural industries and the burden of EU regulation on businesses struggling to compete with India, China and the Pacific Rim. "The French and Dutch votes have in practice provided the first real chance in forty years to press for serious reform in Europe, to reject the self-destructive concept of federalism and to build a genuine partnership of sovereign states. The existing Treaties will need to be renegotiated." Mr Ancram said that the Conservative Party must not be led by someone who will squander this opportunity. I wonder who he had in mind? "I never thought I would find myself writing in support of a Clarke speech as he would not naturally be my first choice as leader, although he has been a friend for years." "Mr Clarke was right to call the war “a disastrous decision”. It is remarkable that this needs to be said at all. Iraq has been this country’s biggest foreign policy disaster since Suez, has made Britain and the world a more dangerous place, and yet has hardly been criticised at all by the Conservative Party. There has been a detached indifference to the massive loss of life: 2,000 Americans, probably ten times that number of Iraqis killed, and perhaps 100,000 injured or maimed for life — for what purpose? It may be difficult to see how the US can lose in Iraq, but it is also not easy to see how it can win in an acceptable timeframe. There may be civil war, Iraq may split. You would have to be an extreme optimist to believe that Iraq will be a united, stable Western-style democracy in ten years’ time... This is a profoundly un-Conservative war. It might have appealed to Gladstone, but even he, I suspect, might have had his doubts. Of course it is true that more democracy would make the Middle East more stable. But democracy cannot be rolled out like Astroturf, and imposing it on backward countries carries huge risks." Lord Lamont actually goes further than Ken Clarke in his opposition to the Blair-Bush policy. The man who was Chancellor before Ken Clarke thinks it might be right to set an early timetable for withdrawal because "The time has to come when the Iraqis assume responsibility for their own destiny." Lord Lamont's openness to a Clarke leadership is another tangible sign that the recent eUro-turn is bearing fruit. Yesterday's Sunday Telegraph survey putting Clarke neck-and-neck with David Davis amongst constituency chairmen was the first. "Ken may be the kind of bloke you would go out for a beer with, but that does not qualify him to be a good leader." "He is just too lazy. He admitted he had not bothered to read the Maastricht Treaty when we were in power. That was typical." "He is a big spender, not a tax cutter, and as Health Secretary he completely failed to reform the NHS." "In recent years, Europe has been one of the most important political issues and Ken got it wrong. You need better judgment than that to be Prime Minister." Given that Lord Tebbit also warns that Mr Clarke's tobacco directorships make him vulnerable to being "smeared up hill and down dale as a merchant of death" it would probably be wise for the Clarke campaign to assume that the former Tory chairman won't be endorsing their candidate. [Click here for Lord Tebbit's recent prescription for a Tory revival].